We are offering Rajasthani Bag to our clients. 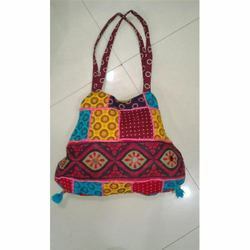 Product Description-We are Manufacture and Wholesaler of Rajasthani Bag, Rajasthani Printed Bag, Rajasthani Carry Bag, Embroidered Rajasthani Bag Etc. Offered by us are exclusive Rajasthani Handbags to the esteemed clients as per their specific preferences & requirements. These Stylish Bags are very stylish and add charm to the personality of the wearer. Moreover, the exclusive formal & elegant look of these bags has increased their popularity in the market. Price Range : Rs. 280This price can be vary depend uopn the quantity, location and sizes. Rajasthani Embroidery Ethnic Bags in different specifications , colours and prices. To cater the variegated demands of our clients, we are highly engrossed in offering a wide range of Fancy Rajasthani Shoulder Bag. The wide array of embroidered Rajasthani Beautiful Handicraft Embroidered Bag available at our end are available in various colors pattern and designs. Our team procure quality raw material to manufacture this array of bags. These bags are easy to carry on soldiers and it appreciated for long life and attractive looks. Avail from us a wide range of Rajasthani Bag, as we are engaged in manufacturing, supplying and exporting in New Delhi, Delhi, India. Our offered bag is fabricated using the best quality raw material that gives the long-lasting nature. We provide this range at moderately prices.